Egypt will exempt tourists from Russia from the $25 visa fee as part of its efforts to offset the effects of the depreciation of the ruble which made Egypt a more expensive destination for Russian vacationers. 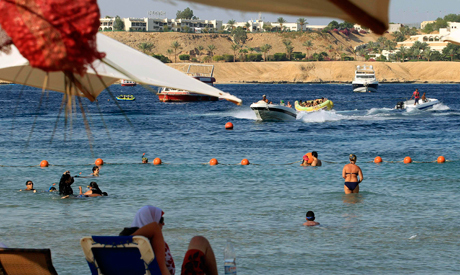 The exemption will last from 15 January to 30 April, traditionally the high season for beach tourism in Egypt, Tourism Minister Hisham Zaazou said in an emailed statement. Zaazou also said he had presented a proposal to the cabinet's economic team to allow Russian tourists to pay for their vacations in Ruble; and Egypt in turn to use these rubles to buy certain Russian products. The "barter" system will be implemented if the central banks of Egypt and Russia approve it, he said. The ruble has lost more than 50 percent of its value since August 2014 on the back of declining oil prices and economic sanctions from the West. Egyptian tour operators and hotel owners, especially in Red Sea resorts, have felt the sting of declining visitors from Russia. Russians are the largest single tourist group in Egypt, making up about a fifth of foreign vacationers in the country in the past four years, as well as 60 percent of tourists to the Red Sea, according to official data. In 2014, about three million Russians visited Egypt, according to the ministry's statement. Egypt’s LE49 billion ($7 billion) tourism industry began recovering in 2014 after plummeting in the second half of 2013 due to the bloody violence that followed the ouster of president Mohamed Morsi. Russia is Egypt's third largest wheat supplier, providing 26.3 percent (765,000 tonnes) of the country's imports in the second half of 2014, Mamdouh Abdel Fattah, vice chairman of Egypt's grain buyer GASC, said in December. If Egypt is so keen on only supporting Russian tourism than my last vist was in 2014. Bye Egypt. Russian Tourists don’t bring their Potato! It’s a joke, don’t take seriously Mr. Dutch-tourist. Seriously, the recent instability in Egypt over the last 3 years deterred most tourists from Western Europe and US to visit. The only 2 groups still visiting, in smaller numbers; the Russians and a few Chinese. It is purely business, that Egypt decided to make it easier for the people who are still visiting, despite the instability at home, and decline in their currency to continue to visit. Europeans, who are brave enough to visit don’t mind the $25 fee. Let’s hope the Euro doesn’t continue to decline further, otherwise we have to wave the visa fees for Europe too!